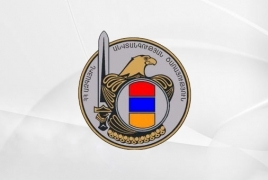 PanARMENIAN.Net - Five wounded soldiers will start working at the National Security Service of Armenia, the director of a special rehabilitation center Armen Muradyan said Friday, February 8. The employees of the National Security Service interviewed some of the servicemen currently working out at the center and hired five of them. NSS Director Artur Vanetsyan had earlier visited the center to reveal that soldiers who had been wounded during service could be recruited in the National Security Service or the Football Federation of Armenia. Vanetsyan also heads the Federation.